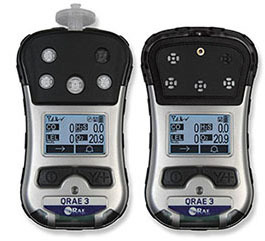 Multi-gas monitors typically feature datalogging capability, as well as audible and/or visual alarms that warn of IDLH or time-weighted average toxic gas concentrations, low oxygen levels, LEL conditions, or malfunction. These monitors may operate in passive (diffusive) mode, or in active mode, in which a pump module draws air across the sensors. Active mode speeds the response time on the meter, but care must be taken to avoid drawing particulates into the monitor. Active mode is used for remote sampling of a hazardous atmosphere: introduce the extendable wand. Calibration gases are available from Geotech. Ensure that the calibration gas is intended for the meter make and model you are using. This is important for multi-gas use because some gases in the mixture can adversely affect other sensors in the same meter. 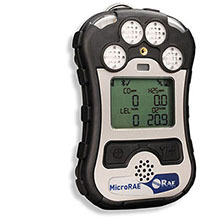 The MicroRAE four-gas portable detector brings enhanced user friendliness and flexibility to wireless gas detection. This enables continuous, instant visibility of safety threats for faster, more informed decisions, to protect workers, facilities, and the environment, and to optimize operations. in Southern California, Colorado, Wyoming and Utah. 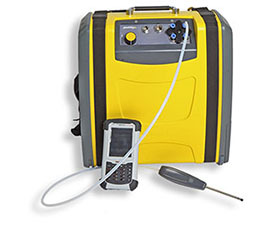 The Gasmet DX4015 multicomponent gas analyzer is designed for on-site measurements of both organic and inorganic compounds at low concentrations in ambient air. With a sample cell that is heated to 50°C (122°F) the analyzer offers versatility and performance in a variety of applications and changing conditions. The Gasmet DX4015 combines Fourier Transform Infrared Spectroscopy (FTIR) analysis technology, a temperature controlled sample cell, a built-in sample gas pump and signal processing electronics in a compact unit to provide reliable measurements with low detection limits and true multi-compound analysis capability. The advanced, easy-to-use Gasmet DX4040 FTIR Gas Analyzer is designed for on-site measurements of both organic and inorganic compounds at low concentrations in ambient air. 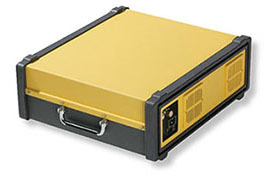 The Gasmet DX4040 combines Fourier Transform Infrared Spectroscopy (FTIR) analysis technology, a rhodium-gold coated sample cell, a built-in sample gas pump and signal processing electronics in a compact unit which provides reliable measurements with low detection limits and true multi-compound analysis capability.